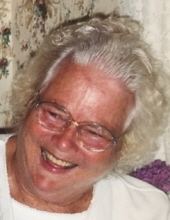 Bonnie Lee Metternich, age 85, a lifetime resident of Nauvoo, Illinois, passed away Tuesday, March 19, 2019 at Unity Point Hospital in Keokuk, Iowa. She was born on May 7, 1933 in Ft. Madison, Iowa, the daughter of Delbert John and Ida Mae Walther Lutz. On May 4, 1952, she married William Joseph Metternich. He preceded her in death on April 13, 2001. In her high school years, she worked at the Hotel Nauvoo as a waitress and later years at Schaeffer Pen in Ft. Madison, Iowa. She was a devoted farm wife, and kept busy with livestock, gardening, canning and raising grapes, apples, peaches and produce to sell at Farmers’ Market in Iowa. The family was involved in Nauvoo Trailblazers Saddle Club, driving a team of ponies, pulling a wagon, with their five children on horseback. Bonnie read meters for WIEC and served as a Sonora Election Judge. She was a member of the Nauvoo Presbyterian Church, serving as a trustee, elder and Presbyterian Women’s Club. Bonnie is survived by three daughters: Donna (Roger) Kirkhart of Cantril, Iowa; Lou Ann (Tony) Murphy of Osage, Iowa; and Sara (Paul) Mankiewicz of Escondido, California. Two sons: William Alan (Julie) Metternich and David (Lou Ann) Metternich of Nauvoo, Illinois. Also eight Grandchildren, Joe Kirkhart, Mindi Kirkhart of Cantril, IA; Nadezhda Murphy of Osage, IA; Craig Metternich of Warsaw, IL; Brenda Hoelscher of Plymouth, IL; Jill Lionberger of Dallas City, IL; Jeremy Metternich of Lake Worth, FL; and Michael Metternich of Grovetown, GA. Fourteen Great Grandchildren: Bree and Colton Kirkhart; Mayci Williams; Kade, Liam and Dayona Metternich; Evan Hoelscher; Ava, Allie and Jesse Lionberger; Lucca and Haven Metternich; Hailey and Isaac Metternich; one brother Ronald (Carolyn) Lutz of Mt. Pleasant, MI and many nieces, nephews and cousins. Bonnie was preceded in death by her parents, Delbert and Ida Lutz; her husband, Joe; brother, Billy Ray Lutz. Services will be held at 10:30 a.m. Saturday, March 23, 2019 at Schmitz-Banks & Beals Funeral Home in Nauvoo. Burial will be in the Nauvoo City Cemetery at Nauvoo, Illinois. Friends may call after 2:00 p.m. Friday, March 22 at Schmitz-Banks & Beals where the family will receive friends from 5:00 until 7:00 p.m. A memorial fund has been established for the Nauvoo Food Pantry or the Nauvoo Fire Department. To plant a tree in memory of Bonnie Metternich, please visit our Tribute Store. "Email Address" would like to share the life celebration of Bonnie Metternich. Click on the "link" to go to share a favorite memory or leave a condolence message for the family.